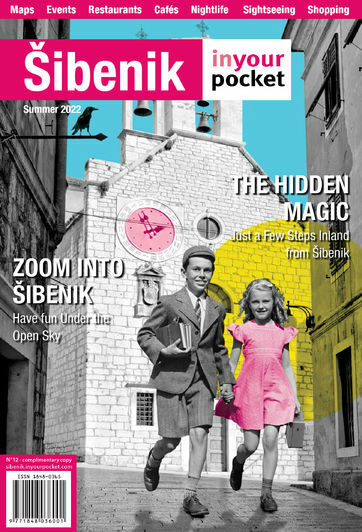 Šibenik County (or Šibensko-kninska županija as it is known in Croatian) offers a huge amount of variety, with swanky yachting marinas and party-till-sunrise tourist resorts rubbing shoulders with archaic villages and large tracts of sun-parched Mediterranean maquis. The Krka and Kornati national parks are the two must-do daytrips, although with islands, coves and stony hillsides in abundance, you’re unlikely to be stuck for natural beauty spots. Although joined to the mainland by a short and stumpy bridge, Murter is technically an island and still feels like a self-contained world of its own. Relatively low on large-sized package hotels, Murter has developed a regular clientele of independently-minded tourists who sleep in the island’s plentiful supply of private rooms and apartments, and - although it can be busy in summer - it has a more laid-back atmosphere than the mainland towns. 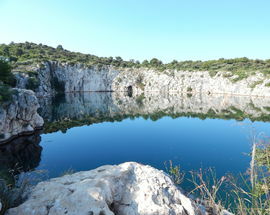 Murter is also a beautiful, relatively unspoiled parcel of Adriatic nature, made up of a sequence of rocky hillocks, pines and tamarisks, and acre upon acre of olive trees – many growing wild amid thorny Mediterranean maquis. Piles of stone heaped up on the hillside recall the times when local villagers cleared the rocky ground to create small patches of cultivable land, collecting the spoil into thick dry-stone walls that have slowly collapsed with time, creating the enigmatic cones and pyramids seen today. 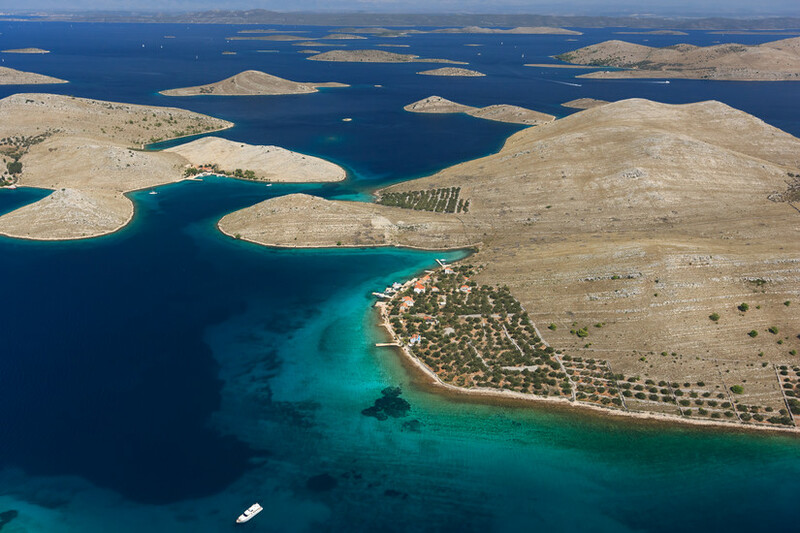 Over to the west are the alluring profiles of the Kornati islands, and it is Murter’s status as main gateway to the Kornati National Park that brings a constant stream of nautically-inclined visitors. Tisno is Dalmatian dialect for ‘narrow’, which is an accurate description of the town’s location, hugging both shores of the narrow strait that divides the island of Murter from the Croatian mainland. The bridge that spans the strait is raised at regular intervals (twice a day in summer, at 9am and 5pm) to allow boats to pass through the town. There is an engaging huddle of old buildings in the historic core of the town on the south side of the bridge, where the 18th century Katunarić Palace contains a small history display including finds from a Roman villa at nearby Plitka Uvala bay. Paths lead up beyond the Parish Church of the Holy Spirit (Crkva svetog Duha) to the hilltop shrine of Our Lady of Caravaggio (Gospe od Karavaja), a popular pilgrimage site established by families who moved here from northern Italy in the late 17th century. There are sumptuous views of the surrounding countryside from the top. Back at sea level, the town’s long coastline on both sides of the straits makes it perfect for extended shoreline strolls. The rock-and-pebble beaches at Lovišča (southwest) and Jazina (northwest) are ideal for a family-oriented splashing-around holiday. A relatively tranquil port sprawling around a broad bay. Jezera (“the Lakes”) gets its name from the seasonal ponds that used to appear on the outskirts of the entrance to the village. One of them, called Lokva (”Puddle”), still exists behind the Parish Church and fills with water in rainy periods of the spring and autumn. The other one, known as Blato (“Mud”), further south, was filled in during the early 20th century and is now grazing land. Jezera’s pretty centre spreads horseshoe-style around a bay raked with yacht jetties and breakwaters. The hilltop chapel of Sveti Rok (immediately south of the Lokva) provides an easy target for recreational hikers. The best beaches are a long walk (or short drive) south of the village, in coves such as Podjasenovac and Kromašna. The rural tracks linking Jezera with these and other bays forge their way through olive groves and are ideal for cycling. Follow the coastal path south from Slanica and you will arrive after 20-30 minutes at Čigrađa beach, an attractive crescent of pebble bordered by a jetty for small boats. Behind the beach lies a cool beach bar in the shape of Lantana (see p.35) and a well-regarded seafood restaurant (the Čigrađa, see p.29). Čigrađa can also be reached by road from the centre of Murter – take the main southbound road out of town and turn right when you see the sign. Over on the northeastern side of the Gradina headland (and within easy walking distance of Murter), the village of Betina used to be a major ship-building centre and part of the seafront is still taken up by small repair yards catering for yachts and local fishing boats. At the centre of the settlement is a kasbah-like maze of narrow alleys grouped around the Parish Church of St Francis (Crkva svetog Frane), famous for its distinctive octagonal belfry topped by a bulbous red dome and spindly weather vane. Occupying a semicircular peninsula 23km north of Šibenik, Pirovac centres on a palm-splashed sea front bordered by a tidy agglomeration of modern houses and holiday villas. A gate in a surviving stretch of town wall leads through to the historic centre of town, a cluster of ancient stone houses and cobbled alleys grouped around a 16th-century parish church. Thirty minutes’ walk along the seafront from Vodice, Tribunj is a relatively calm fishing village centred on a thumb-shaped island joined to the mainland by a bridge. There’s a tight cluster of old houses on the island itself, and a large yachting marina on the opposite side of the bay. Overlooking the bridge on the mainland side is the Parish Church of Our Lady (Crkva velike Gospe), a 19th-century building containing a cluster of neo-Baroque altars and a shrine to Saint Nicholas (the patron of sea-farers) that features an intricate model ship. For those who need to stretch their legs, a path leads up behind Tribunj’s parish church towards the hilltop chapel of St Nicholas, passing shrines marking the Stations of the Cross on the way. There are splendid views of the coastline from the summit. To the west of Tribunj, Sovlja is a small settlement resting on a shallow inlet, with a rock-and-pebble beach that’s a peaceful alternative to those in nearby Vodice. 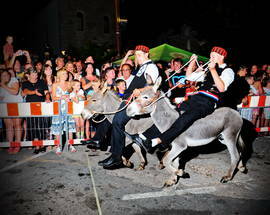 Tribunj’s other main claim to fame is the festival of donkey races that takes place every year in the first week of August. 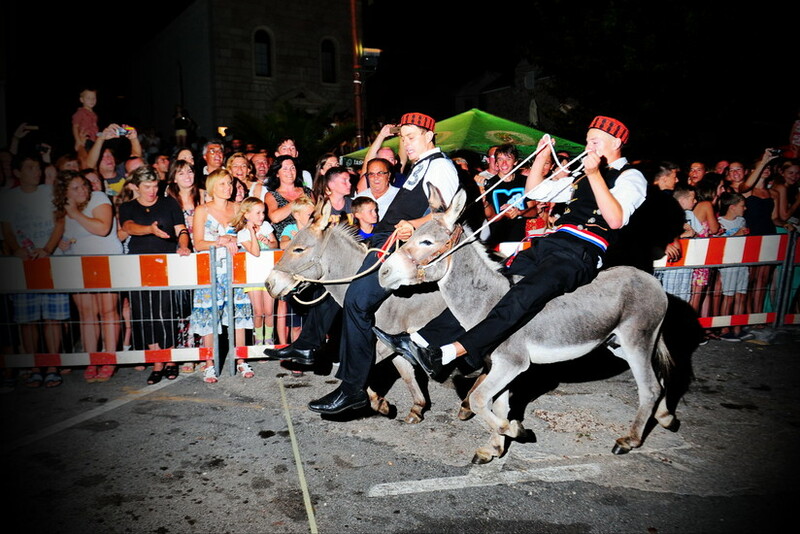 The traditional local affection for the four-legged braying beast is nurtured by the Tribunj-based Hrvatski Tovar (“Croatian Donkey”) organization, formed in 1999. There is a donkey reserve on the island of Logorun just offshore to the southwest. 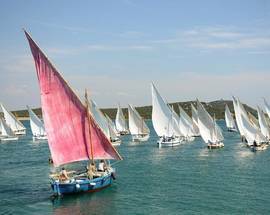 Twelve kilometres north of Šibenik, Vodice is the most-visited tourist resort in the region, with modern hotel developments on either side of its broad bay and a large and well-equipped yachting marina in the middle. There is a small nucleus of historic buildings and narrow streets in the centre of Vodice, surrounded by a pleasantly low-rise sprawl of family houses and tourist-oriented apartment buildings. Vodice’s beaches consist mostly of concrete, gravel and pebble, so don’t get too excited about building any sandcastles. The town gets its name from the many sources of drinkable water in the area (voda is Croatian for “water”). Indeed the city of Šibenik was supplied by ship with drinking water from Vodice right up until the 1870s, when its own piped water system was constructed. Grandest of the old buildings in the centre is the Ćorić Tower, sole surviving remnant of fortifications built in the 15th century to defend the town against the Ottomans. A solid-looking townhouse nearby holds the Vodice Aquarium, which contains an entertaining and educational display of Adriatic sea creatures, which – featuring sea bream, sea bass and dentex – looks rather like a 3-D menu for the seafood restaurants you might be eating in later. Upstairs is a fine collection of antique amphorae salvaged by underwater archeologists, and an impressive collection of model boats from all ages and countries – they range from traditional Croatian fishing vessels to the 17th-century Swedish warship Wasa, that famously sank within twenty minutes of its launch. Catching sight of Primošten from the coastal road is one of the many love-at-first-sight experiences that the Croatian Adriatic has to offer. 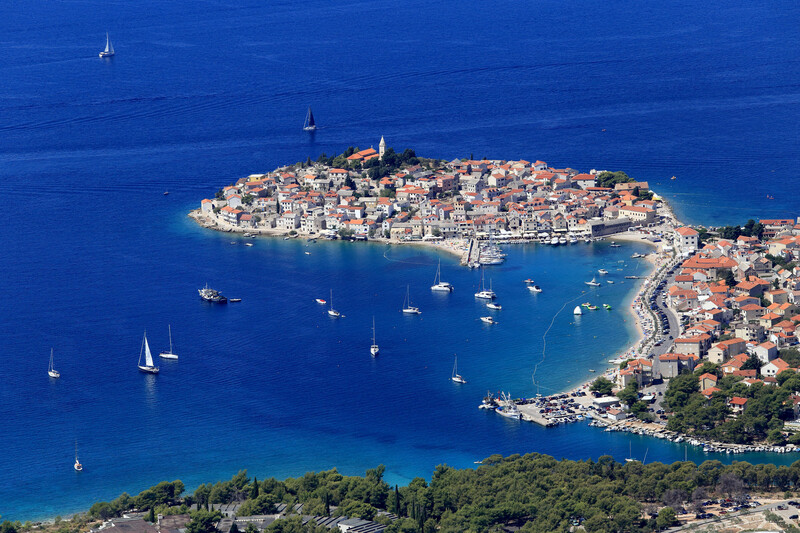 An attractive old town is squeezed onto an thumb of land jutting into a turquoise sea, while the wooded peninsula of Raduča sprouts off to the north, fringed by a large and splendid gravel beach. 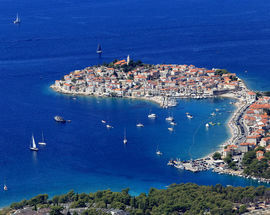 Primošten’s origins go back to the Ottoman conquest of Bosnia in 1463, when the Croatian-speaking population of the interior increasingly sought refuge on the Adriatic coast. The oval-shaped island known as Gola Glava (“Bare Head”) was one of the places they settled. A wooden bridge was constructed to join the island onto the mainland, and the resulting town became known as Primošten (which might be loosely translated as “the place with a bridge across”). As the Ottoman threat receded, the wooden bridge was replaced by a stone causeway, turning Primošten into the peninsula town that visitors see today. On the landward side of the causeway is the dainty stone-roofed Chapel of St Rock (1680), beside which is a statue of Don Ivo Šarić (1915-1944), who attempted to protect the local population against atrocities by both Italian and German occupiers during World War II, before finally being murdered by the latter. In front of the statue stretches a typically sweet-smelling Adriatic garden filled with lavender bushes, rosemary, and a clutch of palm trees. Presiding over the causeway to the Old Town is a much-loved piece of sculpture depicting a local fisherman accompanied by wife and donkey. At the opposite end of the causeway, an arched gate leads through a stretch of crenellated wall into the Old Town, where a tangle of narrow streets surround the 15th-century parish church of St George. Much favoured by Hollywood director Orson Welles (who had a summer villa here), the beaches of Raduča are packed with bathers in summer. Occupying the high ground uphill from Primošten is an enchanting area of maquis-choked villages and country lanes lined by dry stone walls. Densely planted with olives and vines, this was the agricultural heartland of the region until tourism took off and the working lives of the locals become focused on the coast. All of the villages here have suffered rural depopulation, and once profitable crops have been left to go to seed – although an increasing number of local families are returning to their ancestral properties and revitalizing the olive groves. The region’s rich stock of traditional stone buildings is increasingly appreciated too, as can be seen from the popularity of the restored Jurlinovi Dvori farmstead in the hillside village of Draga. As well as containing ethnographic displays and an art gallery, Jurlinovi Dvori also offers food and drink, and has become a major tourist attraction as a result. Most of the visitors are pre-booked groups, although individual tourists are welcome to look around as well. The restored farmstead represents the life’s work of local priest Don Stipe Perkov, who was born in the main house and whose family have been masters of the property for several generations. The farmstead consists of a 300-year-old main building where visitors can see traditional textiles, a restored kitchen and an antiquated-looking rakija still. On the opposite side of a terraced garden are several outbuildings that were acquired by the family later, holding a small museum of church silverware and a picture gallery of works donated by contemporary Croatian artists. For more information see Agritourism on page 51. The best of Šibenik county’s velvety Babić wine comes from the vineyards ranged across the hills around Primošten, a geometric cluster of small rectangular plots owned by individual local families. With each of these rectangular parcels surrounded by a dry-stone wall, the vine-bearing hillside terraces look strikingly decorative when seen from a distance, and are somewhat appropriately described as the “stone lace of Primošten” in local tourist literature. These terraces are the result of generations of back-breaking toil: the rocks that cover the local landscape had to be laboriously broken up in order to create cultivable patches of land. Primošten’s oldest vineyards probably date from the 16th century, although extra impetus to their development was provided by post-World-War-II land redistribution, when the area around the Kremik Gulf southwest of town was divided up and shared out among the locals. Over the course of ten years hillside terraces were built, fields were cleared and dividing walls were erected with geometrical precision, producing the unique vineyard landscape that can be seen today. Such is its beauty that the Croatian government is considering putting the Primošten Vineyards forward as a candidate for inclusion on the UNESCO’s World Heritage List. Best way to admire the vineyards is to head for Kremik yachting marina, which lies at the bottom of several terraced slopes. Several foot- and bicycle paths allow visitors to explore the landscape at close quarters. Southernmost of Šibenik County’s seaside resorts is Rogoznica, an attractive island village joined to the mainland by a 100-metre-long bridge. With a huddle of stone houses rising above a palm-splashed Riva, it’s an undeniably attractive spot, and the Frapa marina on the opposite side of the bay has made it a hugely popular destination with the yachting crowd. Situated on the western fringe of the village, Frapa is open to outsiders, with a central semicircular building holding restaurants, bars and a nightclub. Just behind the marina is Zmajevo Oko (“Eye of the Dragon”), a crater-like salt-water lake surrounded by grey cliffs. North of the marina is the Gradina peninsula, boasting a significant stretch of pebble beach backed by dense pines. Inland from Šibenik lies a dry rocky plateau characterized by jagged chunks of limestone and a scattering of wiry shrubs. Here and there the maquis has been cleared to provide space for vineyards, olive groves and pastures, the plots divided up by dry-stone walls. Despite the existence of major towns like Drniš, Knin and Skradin, large tracts of land feature little apart from isolated farmsteads and end-of-the-road villages, many featuring the rough-hewn stone architecture typical to this part of Dalmatia. 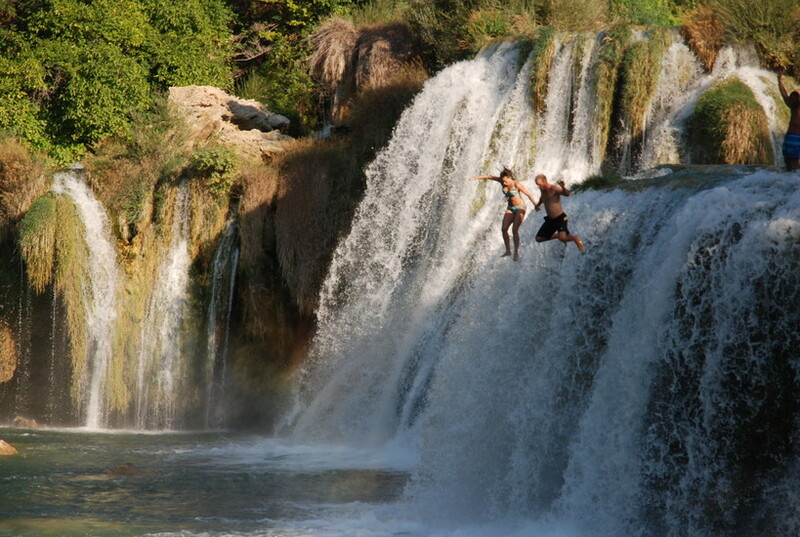 The river Krka is the area’s main natural feature and the Krka National Park is the most-visited regional sight – the park is covered under a separate section below. Hugging the high ground above the Čikola river, Drniš was a medieval fortress town before falling to the Ottoman Turks in 1522. Nowadays it is an important market centre midway along the main road from Šibenik to Knin. Ruins of the medieval fortress poke up from the Gradina, the rocky hill above town. Little remains of this medieval strongpoint save for a stark portion of the southern tower, which pokes up from the hill like a bad tooth. Nearby is a minaret dating from around 1500, all that’s left of an Ottoman-era mosque. Thanks to a new lighting system installed in December 2010, these ruins are dramatically illuminated at night. Occupying pride of place in the town itself is St Anthony’s Church, a 16th-century mosque that was converted to Catholic use in the 1670s by Franciscan monks from nearby Visovac. Housed in the former home of Drniš politician Nikola Adžija (1875-1972), the Municipal Museum has archeological and ethnological displays alongside a collection of works by Croatia’s greatest sculptor Ivan Meštrović (1883-1962), who spent his early years in nearby Otavice. Adžija was one of the early supporters of the young Meštrović, helping to raise money that paid for the promising local lad’s studies. Sprawled across a green plain overlooked by the bleak Dinara mountains, Knin has long been a town of crucial strategic importance, controlling the medieval trade routes linking Dalmatia with the Balkan interior, and in more recent times the location of a major railway junction. It’s most famous sight is Knin fortress, an impressively well-preserved agglomeration of crag-hugging walls and towers that hovers above the winding Krka river. An important strongpoint from the 10th century onwards, Knin became the capital of Croatia under King Zvonimir (ruled 1076-1089), a status it retained until 1097 when Croatia accepted the rule of the Hungarian crown. Knin remained a much-coveted military prize, falling to the Ottoman Turks in 1522, who were in turn turfed out by the Venetians in 1688. Knin served as the headquarters of Serbian-occupied territory during the 1991-1995 war, and the raising of the Croatian flag over Knin fortress in August 1995 brought a highly symbolic end to hostilities. Central Knin is not a wildly exciting place, and it’s best to make your way straight to the fortress. The steep climb is rewarded by superb views of the surrounding countryside, with the mountains of the Dinara range filling the northern horizon. The fortress itself is an extensive and highly evocative complex of fortifications constructed at different stages, filled with a maze of cobbled alleys, ramps and stairways beneath ivy-covered walls. Spearing up from the highest point of the fortress is a flagpole hung with an unusually large Croatian tricolor, a reminder of Knin’s highly significant place in the history of modern Croatia. In the eastern part of the fortress, a former barrack building houses an ethnographic collection displaying costumes and agricultural implements from the Knin region. Nearby, the fortress’s former hospital plays host to an archeological museum. Ten kilometres east of Drniš, the sleepy village of Otavice is celebrated for the domed grey Church of the Holy Redeemer that squats on a low hill on the fringes of the village. It was built in to serve as a family mausoleum by the sculptor Ivan Meštrović, who spent much of his childhood here before pursuing a long and fruitful artistic career in Vienna, Zagreb then the USA. Begun in 1926, the building contains some of Meštrović’s most haunting reliefs, with an ethereal Crucifixion flanked by serene portrayals of the Evangelists. Mass is only held here once a month, but the church is open as a tourist attraction during whole year. Twenty kilometres north of Šibenik on the main road to Knin, Pakovo Selo is a traditional inland-Dalmatian village famous for its sheep – and its tasty sheep’s cheese, sir iz mišine, matured the traditional way by being stuffed into a tube made of sheep entrails. 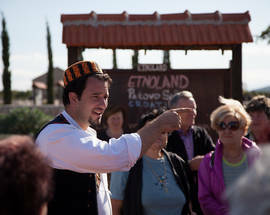 Pakovo Selo owes its place on the global tourist map to Etnoland, an ethnographic theme park that aims to introduce visitors to the traditional lifestyles of the Dalmatian karst. 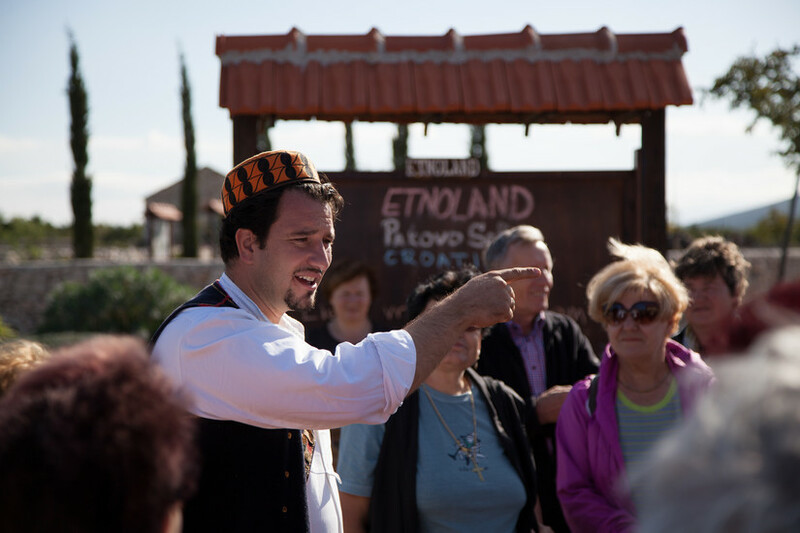 Just off the village’s main crossroads, Etnoland is a walled complex containing a collection of traditional stone buildings, each holding a display of olde-worlde furnishings that reveal something about Dalmatian life a century or so ago. Etnoland is geared up to receiving pre-booked groups, and individual tourists should reserve well in advance and be prepared to pay the full group price. The standard tour lasts 2.5 hour, and includes a welcome swig of rakija, a spot of pršut-and-wine tasting, awarded guide tour of the displays and a full meal. For more information see Agritourism on page 52. Squeezed into a sheltered bay near the point where the river Krka flows into the Prukljansko Lake, Skradin was a flourishing settlement in the Illyrian and Roman periods (when it was known as Scardona), and subsequently served as the 13th-century power-base for the Šubić princes of Bribir, one of Croatia’s leading aristocratic clans. Skradin fell to the Ottomans in 1522 and most of its population fled to Šibenik, although it was regained by the Venetians in 1684. 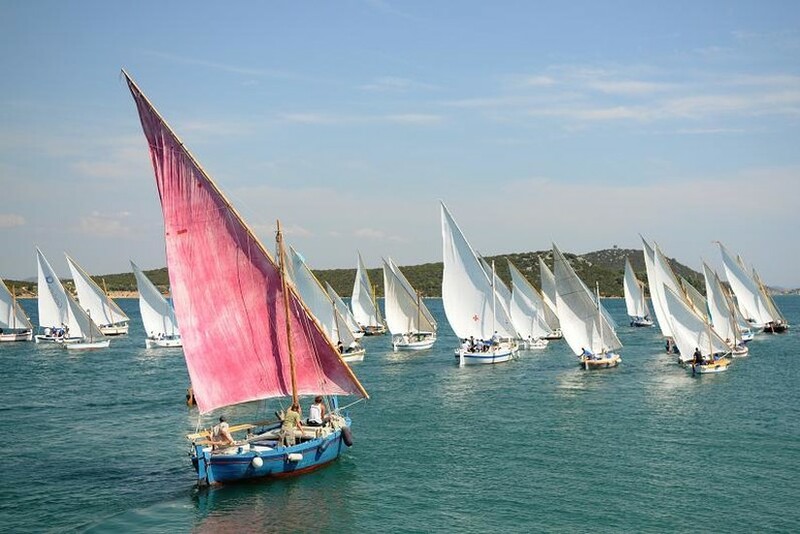 Nowadays it is an important stepping-stone for tourists bound for the Krka National Park, and an important inland stopping-off point for yachtsfolk touring the Adriatic coast. Skradin is increasingly well known as a gastronomic destination, too, boasting a handful of restaurants offering superb seafood and some unique regional treats. Lapped by the waters of the Krka, Skradin’s Old Town is centred on the triangular Trg Male Gospe, site of a handsome Baroque parish church with a free-standing belfry. From here a pedestrianized main street heads north, with an atmospheric sequence of arched alleyways leading off on either side. Constantly busy with fishing vessels and yachts, Skradin’s waterfront is also the departure point for shuttle-boats into the Krka National Park (see p.44). Much of the landscape inland from Šibenik is shaped by the Krka, the 72.5km-long river that rises in the arid karst near Knin before flowing towards the Adriatic via a spectacular series of rugged canyons, azure lakes and tumbling waterfalls. The valley’s most dramatic stretches, between Skradin and 3.5km downstream of Knin, fall under the protection of the Krka National Park (Nacionalni park Krka), which is visited by an average of one million people a year. About 90% of these visitors never get any further than Skradinski buk (the most dramatic of seven sets of rapids within the park), whose foaming waters are reproduced on the cover of many a tourist brochure. 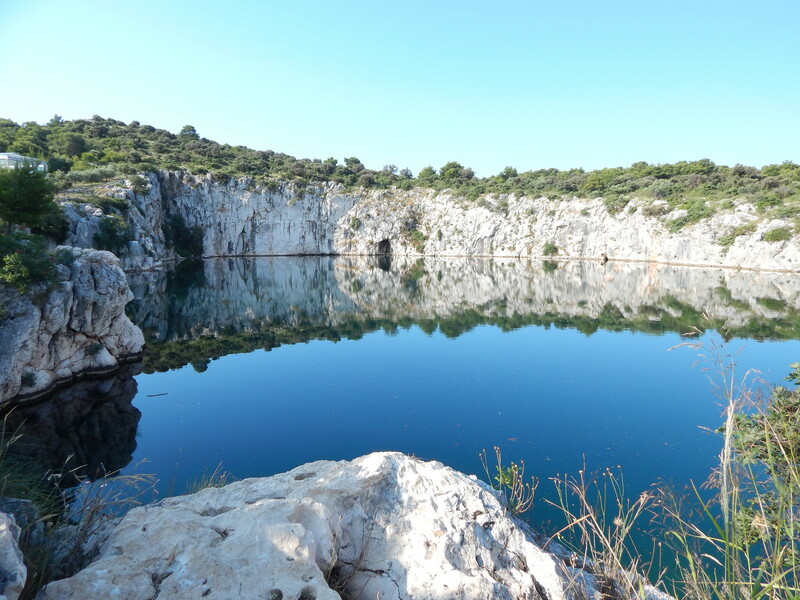 However there is much more to the Krka than Skradinski buk, especially in the upper (northern) reaches of the park, where visitor facilities and trekking routes are recently being developed. Fauna in the park includes roe deer, wild boar, and the more elusive wolves and badgers. The rocky sides of the valley play host to various communities of bats, who play an important role in eating mosquitoes and other irritating waterside insects. It’s also an area rich in historical resonances, with ruins of fortresses recalling the region’s erstwhile status as a disputed borderland between warring empires, and waterside monasteries providing evidence of a rich spiritual culture. Daily tickets (180kn adults, children 130kn) and three-visit tickets (320kn adults, children 200kn) that includes three visits to the Park within a one week period from the date of purchase and can be bought at Skradin branch office or at the entrance points described above. The ticket price includes rides on the national park’s shuttle boats from Skradin to Skradinski buk, but does not include travel on excursion boats heading further north into the park – these must be paid for separately. Most popular part of the park is Skradinski buk, where the Krka flows over a series of waterfalls and rapids formed by the gradual build up of dam-like barriers of travertine, the limestone sediment that settles on branches, grasses and moss to form a solid substance. This is very much an ongoing process, with Skradinski buk’s travertine barriers growing and changing shape at a rate of 1-2mm per year. 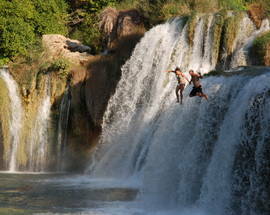 The travertine at Skradinski buk has created 17 principal falls, each of which is made up of multiple cataracts. The place gets its name from the Croatian word buka (“racket”), a reference to the noise generated by the water rushing over the rapids. Skradinski buk was once a milling settlement at which the rushing waters of the Krka were harnessed to power a variety of machines. Some of the stone mill buildings have been restored, and visitors can see working examples of flour and fulling mills, alongside displays of traditional costumes and agricultural implements. Just below the mills is the Imperial Belvedere (Carski vidikovac), a small balustrade lookout point built for visiting Habsburg monarch Franz Joseph I in 1875. A little further downstream are the ruins of Jaruga 1, the hydroelectric power station built by Šibenik mayor Ante Šupuk and brother Marko Šupuk in 1895. It was the second AC-generating hydroelectric project in the world, the Forbes dam on the Niagara Falls having been completed just months previously. The Šupuks formed a private company in order to build and manage the power station, the first of its kind in Dalmatia. When Šupuk died in 1904, the whole of Šibenik’s electric lighting was switched off in his honour. Immediately downstream from Jaruga 1 is a wooden bridge that crosses a wide pool of river water right below the biggest of Skradinski buk’s waterfalls. This broad stretch of shallow water is Skradinski buk where you are allowed to swim, although a barrier of plastic buoys prevents bathers from getting right up close to the waterfall itself. On the other side of the river is a network of trails leading up and down the hillside beside many of Skradin’s tumbling streams, many on raised wooden boardwalks built on stilts to keep your feet dry during bouts of seasonal flooding. Hovering above the river Čikola, which flows into the Krka just upstream from Skradinski Buk, Ključica Fortress is part of the fortification system developed by the medieval Nelipić family, who controlled the trade routes between Šibenik and Bosnia and levied duty on goods transported in both directions. The Nelipić clan’s tight grip on commerce was much resented by others in the region, and Ključica was sacked by forces from Šibenik in the mid-14th century. Subsequently occupied by the Ottomans, it fell into disuse when they were driven out by the Venetians in 1684. Boat trips from Skradinski buk head up the river into the so-called Visovac Lake, a stretch of the Krka which measures 800m from shore to shore at its widest points. Grey-green hills rise steeply on either side. Main destination for the excursion boats is Visovac Monastery, picturesquely located on an island 7km upstream from Skradinski buk. A Franciscan foundation has existed on this site since at least the 14th century, although the church we see today was built in 1576. Long a centre of Catholic Christianity in the region, it nowadays holds a seminary, as well as being the site of a much-visited church. A decree issued by Ottoman Sultan Mehmet IV, returning Visovac to the Franciscans in 1674, is held in the monastery treasury. Upstream from Visovac, the ruins of Kamičak fortress can be seen on the cliffs above the eastern shore. Again built by the Nelipić family in the 13th century, it was demolished by the conquering Ottomans after 1522. Excursion boats continue from Visovac to Roški slap 5km north, a barrier of foaming waterfalls and cataracts that marks the northern end of Visovac lake. Roški slap is also accessible by car from the west (via minor roads from Đevrske) or the east (via minor roads from Pakovo Selo), although parking space is limited when you get there. As at Skradinski buk, there is a restored millers’ settlement beside the river, with displays of milling and weaving techniques inside. Located on the western bank of the Krka about 10km north of Roški slap (and accessible via minor road from Kistanje), the Monastery of the Archangel Michael is arguably the best known of Croatia’s handful of Orthodox monasteries. It was founded in 1345 thanks to an endowment by Princess Jelena, a sister of the Serbian Tsar Dušan who married a Croatian prince of the Šubić family. Famous for its Romanesque bell tower and arcaded cloister, the monastery is also known for its early-Christian catacombs – although they are not always open to visitors. Roughly opposite the monastery is another of the Nelipić cliff-top fortresses, Bogočin. North of the monastery lies the most dramatic stretch of the river, a narrow winding canyon with sheer sides. Perched on cliffs on either side of the canyon are two of the park’s most dramatic fortresses, Nečven to the east, and Trošenj immediately opposite to the west. Trošenj once served as the power base of the Croatian Šubić family, although the Ottomans subsequently turned it into a gaol. It was notorious as a place of execution - throwing offenders from high windows being the favoured form of capital punishment. Just outside the park’s western boundary, the road from Kistanje to Knin forges across maquis-covered karst, passing the site of Burnum, the 1st-century Roman legionary camp that subsequently developed into a civilian settlement. On the western side of the road lie the remains of an amphitheatre, while further up to the east are the remaining two arches of the former military command post. An educational hiking trail goes from Burnum to the Manojlovac viewpoint. Two kilometres north of Burnum, a turn-off to the east twists its way down into the canyon of the Krka, crossing the river at Brljansko lake and climbing up onto the plateau on the opposite side. A signed exit leads to an Archeological display devoted to finds from nearby Burnum opened in 2010. There is also a look-out point affording fine views of the canyon. The islands of Krapanj, Zlarin, Prvić, Kaprije and Žirje may seem close to Šibenik geographically, but are light years away in terms of atmosphere. Featuring stone-built settlements that appear to have changed little in decades (perhaps even centuries), surrounded by relatively unspoilt nature, they offer an entirely different experience of the Adriatic. Getting to the islands is easy: Krapanj is accessible by boat (roughly hourly) from Brodarica, the coastal village 7km southeast of Šibenik; while Zlarin and Prvić lie on the route of the Šibenik-Vodice ferry (2-4 daily depending on season). A separate ferry service (1-2 daily) sails from Šibenik to Žirje and Kaprije. Named after the locally abundant caper (kapar in Croatian), Kaprije is a blissfully unspoiled island with no roads and hardly any motor vehicles of any sort (officially it’s a car free island, although there are a few old wrecks dotted around the place that got here somehow). The small village of Kaprije caters for the hundred-or-so permanent inhabitants. Private rooms and apartments cater for a summer influx of tourists, although the island is never in danger of being overrun. 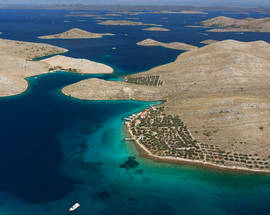 Kaprije’s uniquely sheltered bay is an increasingly popular anchor-dropping point for yachtsfolk exploring the nearby Kornati, while the island’s numerous coves are ideal for a spot of secretive bathing. Lying only 300 metres off the shore of Brodarica, the low-lying island of Krapanj was once famous for being the centre of the Adriatic sponge industry, with most of the island’s male population devoting their time to sponge-diving. Nowadays Krapanj is a relatively quiet but undoubtedly attractive spot, with a line of stone houses along the mainland-facing waterfront, and a handful of souvenir shops selling sponge-themed gifts. Slightly inland from the shoreline is the Franciscan Monastery, founded in 1435 when monks from Bosnia were gifted the island by local nobles. The monastery museum contains religious artworks, including an extraordinarily expressive 15th-century crucifix carved by Split-based priest Juraj Petrović. The walled graveyard next door contains several family tombs honouring one-time sponge divers, many pictured in relief form wearing their large spherical deep-sea helmets. 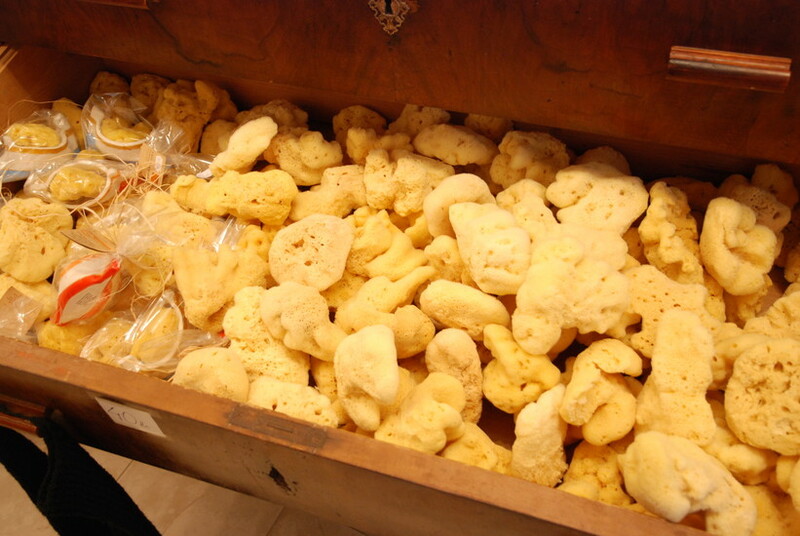 Head to the basement of the nearby Hotel Spongiola to find a small but entertaining display of exhibits connected with the local sponge-harvesting industry, including a lead-booted diving suit, and early 20th-century air pumps. In many ways Prvić is a smaller version of Zlarin, a verdant and unspoiled island with plenty in the way of traditional Mediterranean architecture. It has two main settlements – Prvić Luka at the eastern end, and Šepurine at the west – Prvić has a slightly larger permanent population and is marginally more lively as a result. Prvić was traditionally the summer retreat of Šibenik’s leading families, and remains associated with one great Šibenik name in particular - priest, diplomat and scientist Faust Vrančić (1551-1617). Vrančić was buried in Prvić Luka’s parish church. Educated in Padua, Vrančić served at the Habsburg court in Prague before devoting himself to his writings. His Latin-Italian-German-Hungarian-Croatian dictionary (published in 1595) was a landmark in Croatian language study. His more famous Machinae Novae, published in Venice in 1615, contains 49 copper-plate engravings of machines and inventions, in conscious homage to the inventions of Leonardo da Vinci published several decades earlier. Most famous of the illustrations is Homo Volans, which pictures a man descending through the air attached to a square canvas parachute. English clergyman and scientist John Wilkins, writing some 30 years later, claimed that Vrančić actually tested the parachute himself by jumping from the belfry of St Mark’s Cathedral in Venice. A narrow lane leads over the brow of a hill from Prvić Luka to the island’s other settlement, Šepurine. A hive-like village of stone houses, Šepurine is centred on a parish church whose distinctive bulbous belfry is topped by an extravagant weather vane. Of Šibenik County’s permanently populated islands, Žirje is both the largest, and the furthest out to sea. With a scattering of private accommodation but no hotels (and, like Kaprije, virtually no motor transport), it is something of a Shangri-la among tourists for whom the phrase “getting away from it all” really means what it says. Most of the island is covered in maquis, although vines, olives and figs make up an important part of the landscape. Newly marked bicycle- and footpaths provide an ideal means of exploring the island. Lying right opposite St Anthony’s Channel, the narrow waterway that connects Šibenik with the open sea, Zlarin is a green island covered in olive groves and wild shrubs.Zlarin has got the longest island promenade in Croatia (127.50m). Saint Fortunato is the protector of the island Zlarin so the most frequent names on the island are Srećko, Nato and Refortunato! Coral fishing has been associated with the island ever since the 15th century, when the raw coral was exported to Dubrovnik and other cities to be processed into fashion accessories. During the 1950s coral fishing went into decline due to depleted stocks, although at least one coral-processing workshop still exists on the island, and several souvenir shops open up in summer to sell coral bracelets and earrings. Zlarin village is a beautiful settlement of stone-built houses arranged around a bay. Key landmark is the impressive clocktower built in 1829 and known as the Leroj (local version of the Italian word for clock, orologio), crowned by an attractively spindly weather vane. Slightly uphill to the west is the 18th-century Church of the Assumption, worth a peek on account of the hairy-looking gargoyles gazing down from either side of the pediment. Occupying a stone house at the eastern end of town, Zlarin Museum displays finds from a shipwrecked Roman galley found by marine archeologists just off the Šibenik coast, and an “ethnographic room” containing domestic utensils and traditional costumes. The upper floor of the same building houses the Zlarinka coral workshop, where coral is cut, burnished and made into jewelry. You can admire all manner of necklaces, bangles and baubles in the Zlarinka shop, and take a peek at the polishing process in the work-room next door. Further east, the Chapel of St Simon (Crkvica sv. 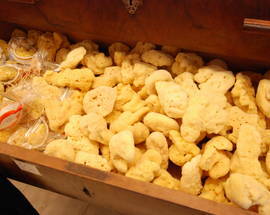 Šime) has a small collection of church treasures, open in the summer months. Continue along the road past the chapel and you’ll arrive after 10 minutes at the Church of Our Lady of Raselj (Gospe od Raselje), a church of medieval origins that contains a miracle-working image of the Virgin. Inside, model ships hang from the ceiling as a gesture of thanks from devout sailors. There is a growing choice of activity opportunities on the mainland too, with cycling and hiking the increasingly popular draws. In the Skradin/Krka area, there are marked cycle paths from Skradin to the waterfalls of Skradinski buk, and from Skradin to the Bribirska Glavica archeological site. There are a couple of bicycle rental points in Skradin during the summer. Some of the most exhilarating cycle itineraries are in hinterland of Primošten, where a network of marked routes make use of both tarmac roads and gravelly off-road trails to explore ancient villages such as Draga, Široke and Burnji together with their hillside-hugging vineyards and olive groves. 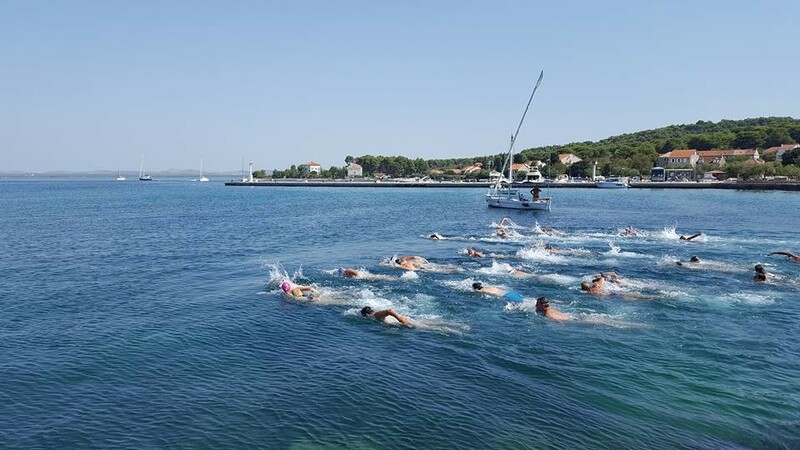 Vodice has its marked cycling roads that connect all the archeological and cultural landmarks on the mainland, as well as the road for the Croatian Cup - MTB tour as well. The island of Murter is also good for biking, especially in spring and autumn when there is not too much traffic on the roads. At the northwestern end of Šibenik county, the seaside resort of Pirovac provides access to the eastern end of the Vransko Jezero nature park, where several biking trails have been marked. You can get a map at any of the respective tourist offices. Strong, surefooted and not afraid of the sun, the donkey was once such a common sight in Dalmatia that for Croatian people donkeys are synonymous with the region. While the standard Croatian word for donkey is magarac, in Dalmatian dialect the word used is tovar, which is related to the word for loading goods or a burden. Inland folks unkindly refer to Dalmatian people as tovari, while the Dalmatians themselves (including Hajduk Split fans) wear the badge with pride.